Il Fornaio Two Part Holiday Promotion-BOOK BY SEPTEMBER 30TH & 1) Any party over 20 people receive a choice of one of the following complimentary offers for every guest: *Glass of Prosecco *Passed Antipasti or *A primi course of pasta & 2)For every $200 you spend the host will receive a $20 gift card. Decorative archways adorned with beautifully quilted drapes create a private dining area to host receptions of up to 65 people. The drapes can be closed to section off the Loggia to accommodate parties of 15 or more. The mosaic tile floors, high ceilings and distinctive furniture give the Loggia an "al fresco" feeling with the indoor comfort of an open-hearth fireplace. Enjoy our unique covered and heated patio area located off of one of the private dining areas can seat up to 80 people which can also be sectioned off to accomodate smaller groups. 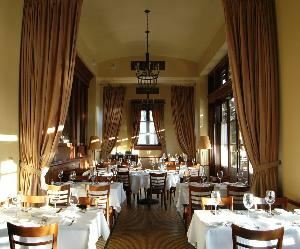 In addition we do not charge a room fee or deposit as long as you will be dining with us.